Noteworthy Fragrances: She simply has no common scents! She simply has no common scents! 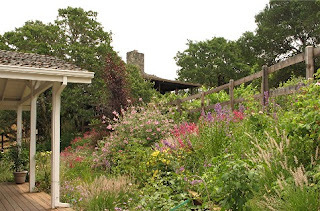 The Sonoma Scent Studio was formally established in 2004 by Laurie Erickson who has always taken inspiration from and sanctuary in the beauty and serenity of nature. Laurie's studio is located in the beautiful rolling hills of Sonoma County in Northern California's wine country. The cottage-style studio and gard ens are surrounded by majestic oaks and overlook the neighboring vineyards. Introduced to fragrant gardens tended by her mother and grandmother, Laurie began blending jasmine and rose absolutes to capture the aroma of her favorite flowers long after the blooming season was over. Some of her favorite scents have been from the house of Rosine and Caron. After years of experimentation, Laurie decided it was time to launch Sonoma Scent Studio and a dream became reality. "It's taken many years to acquire a big enough stock of materials to create really professional perfumes with both naturals and synthetics. My inspiration originally came from nature and gardening, then moved to niche perfumes, and then back to nature again for creating some specific accords. There’s always more to learn." When I asked Laurie where she sees Sonoma Scent Studio in the next two years, she replied, "My goal has been to offer a small line of high-quality, unique perfumes and body creams through my online shop and through some boutiques. I've had interest in my scents from several online niche boutiques, but I'm making myself wait until I have my scent list the way I want it before I start to wholesale. My scent list had become a bit too long and I wanted to pare it down to focus on some of the most special scents." Laurie has learned that being a niche perfume designer has its growing pains of change and she is narrowing her focus by paring down the number of scents she offers for sale on her website. Among the many luxurious ways you can pamper yourself with Laurie's unique hand blended scents, are the indulgent body creams, eau de parfum and perfume oils. I'll quickly cast my vote for Opal, the concentrated perfume oil made with a natural pure fractionated coconut oil base; no alcohol, silicones, water, emulsifiers, sunscreen additives, or colorants are added. The fractionated coconut oil has no odor of its own, has a long shelf life, is very light, dries quickly, and is an excellent light moisturizer. Opal has become one of my new favorite fragrances with notes of a delicate musk, vanilla, ambrette, bergamot and sandalwood. This perfume has an excellent sillage and is remarkably long lasting. I normally shy away from many scents with bergamot as this note is not as complementary to my personal chemistry as I wish it were. The vanilla makes for a warm and snugly scent that radiates desire. This weekend when I was sampling Opal, I know that I'd been wearing it at least two hours, when my hubby looked up from a novel he is writing and asked, "Honey, what did you just put on?" His way of asking what sample I was testing...my surprise was that the oil I had earlier put my wrists had suddenly bloomed again and was a fragrant surprise to us both. 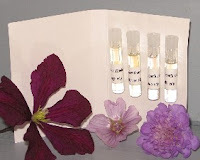 I love my fragrances in the perfume oil version and Laurie has so many unique and intriguing blends, that I'm sure you'll all find your favorite as well! Be sure to visit her delightful blog written in a true journalistic style. I enjoy keeping up to date on what she's busy doing by visiting her blog on a regular basis. 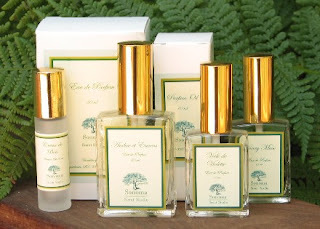 Sonoma Scent Studio products are available online with amazingly fast shipping and come in chic packaging that bespeaks quality all the way. Working in the customer service field for years, I can't emphasize enough her conscientiousness in returning any inquiries I've made with lightning speed. Kudos to you Laurie. Get ready to power shop!